Over three-quarters (77 per cent) of parents surveyed in the latest HSBC Value of Education report would consider sending their child abroad to university, but many underestimate the extra cost. New research from HSBC across 16 countries reveals that on average, the extra cost (compared to the cost of domestic university education) of an international undergraduate education is 6.3 times more than parents would consider paying. This year’s Value of Education report shows how much extra parents would consider paying to send their child to university abroad. 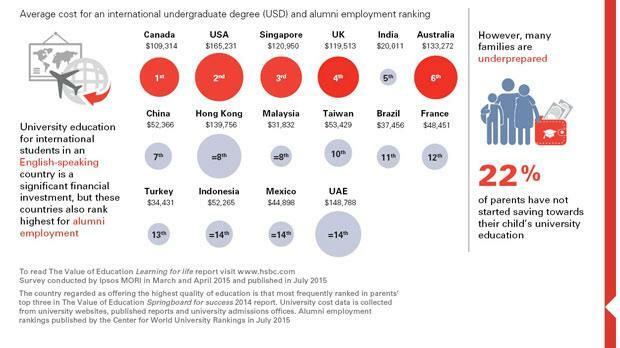 By comparing this expectation with the actual cost of completing an undergraduate degree as an international student (comparisons are based on the country parents regard as offering the highest quality education, HSBC’s The Value of Education Springboard for Success, 2014), it is clear that many parents have unrealistic expectations. The US is regarded as offering the best quality of education worldwide, but the total cost of attaining an undergraduate degree there as an international student can exceed $165,000 (total cost in USD for typical undergraduate degree tuition fees for international students, and living cost), making it the most expensive destination globally. For parents in China, the additional cost of sending their child to university in the US, rather than to a domestic university, is eight times greater than the premium they would consider paying. In Malaysia, parents regard the UK as offering the highest quality education, but the extra cost of sending their child to university there rather than in Malaysia is 8.7 times more than they anticipate. The additional funding required by parents to send their child to university abroad can vary significantly between countries. Parents in India are the most likely to consider paying the greatest premium (60 per cent), but they also face the biggest shortfall, with the actual premium being 12.6 times this amount. This is because in India, where a domestic university education is the least expensive of the 16 countries, parents regard the most expensive destination overall – the US – as offering the highest quality education. Revealing a major gap between parents’ funding expectations and reality, the study also shows that many families are underprepared to face this important investment: over a fifth (22 per cent) of parents have not started saving towards children’s university education. An international university education, especially in English-speaking countries, is a significant financial investment but one that pays off. Canada offers the best career prospects, ranking first of 16 countries for alumni employment (Centre for World University Rankings – Top 1,000 Universities, 2015). The US, Singapore, the UK and Australia respectively rank second, third, fourth and sixth. “Parents recognise the value of an international university education for their children, but often underestimate the costs associated with such an opportunity,” said Charlie Nunn, Group Head of Wealth Management, HSBC.